We were happy to be featured on a recent edition of Eco Company, an environmentally-minded program produced by and for children. This segment aired in September in the San Francisco area. A paint-splattered T-shirt, stained table napkins, moth-eaten sweater, old walking shoes, ripped jeans, curtains the cat shredded—you may as well discard these items. If you can’t use them, nobody else would want them either, right? Wrong. Regardless of condition, USAgain wants your used textile items. USAgain, (pronounced ’use again’) is a nationwide textile recycler that collects and saves used clothes, other textiles, and shoes from landfills. It partners with organizations, including schools, to bring convenient textile recycling service to their doorsteps. “By extending the useful life of clothing and other textiles, we can conserve resources and avoid waste and pollution from new manufacturing, which is responsible for 10 percent of the global carbon impact and 20 percent of industrial water pollution,” writes Mattias Wallander, CEO of USAgain. In 2012, USAgain kept nearly 58 million pounds of textiles out of landfills—more than one million pounds per week. While that’s an impressive figure, consider EPA statistics that only 15 percent of clothing and shoes are recycled, and 11.1 million tons of textiles are trashed annually in the U.S. Started in 1999 in Seattle, USAgain now has a network of more than 12,000 clothing collection points in 18 states. It has green and white collection bins around the Bay Area, including Santa Clara, and a warehouse in Hayward, where shoes are separated from the textiles, which are baled under high pressure. “We chose the Bay Area three years ago because of its population density and well-established commitment to the environment,” says Wallander. So far in 2013, USAgain and Santa Clara have recycled about 8,000 pounds of textiles, preventing the emission of over 55,000 pounds of carbon dioxide. Can’t picture a pound of textiles and its environmental impact? Making one cotton t-shirt, which weighs about six ounces, takes 700 gallons of water and 1/3 pound of pesticides and herbicides and generates 14 pounds of CO2. Seventy percent of the world wears secondhand clothes. USAgain sells the textiles it collects directly to thrift shops in the U.S. and grading companies that sell the wearable items to exporters to Eastern Europe, South America, and Africa. Thrift shops eventually sell their leftover clothing to graders. This secondhand clothing trade is valued at over $1 billion worldwide, with the U.S. being the world’s largest exporter. Nothing gets wasted. The graders sell what cannot be reused as clothing to manufacturers that transform it into new items such as wiping rags, placemats, wine bottle coolers, and even insulation made from denim. Visit the USAgain website (www.usagain.com) for clothing drop box locations and information about hosting a drop box or sponsoring a collection drive at your business or school. Schools can partner with USAgain to organize a textile recycling fundraiser to benefit the school. November 15 is America Recycles Day (www.americarecyclesday.org)—perhaps a good day to clean out your clothes closet. Click the thumbnail to learn about some of the work we’ve been doing in California. 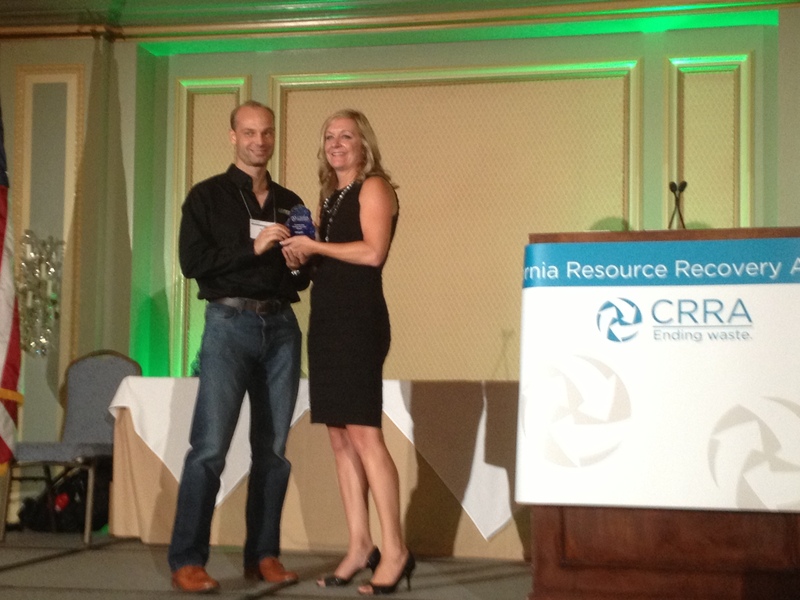 USAgain was the recipient of the California Resource Recovery Association’s award for Outstanding Commitment to Closing the Loop in 2013. CRRA presents several awards at its annual conference. The award for Outstanding Commitment to Closing the Loop is given to a business, government agency, community-based organization or school that has implemented an innovative program that features the procurement of products that reduce waste, have recycled content and/or are safer alternatives to toxic products. USAgain proudly sponsored the 8th annual Greenlight Earth Day Film Festival in Palo Alto, CA. The event featured short films exploring environmental stewardship and how individual actions can benefit the environment, all which were produced by elementary, middle and high school filmmakers from Bay Area schools. The Festival also featured the first annual Eco-Fashion show, which USAgain sponsored by providing clothing. 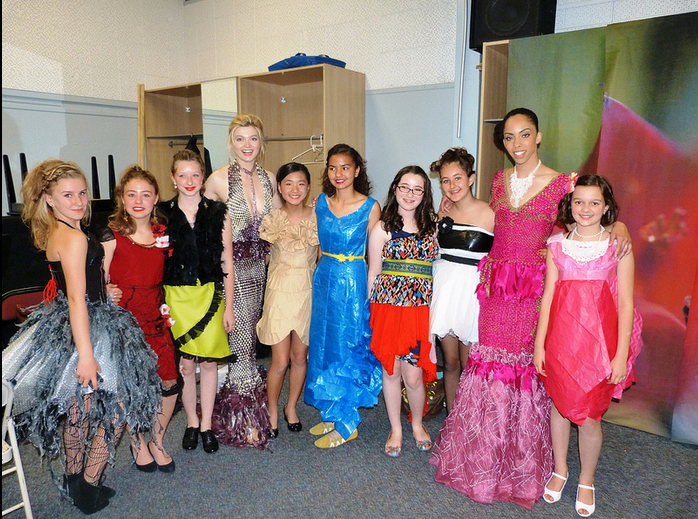 Students used clothes from USAgain to design outfits for the Eco-Fashion show. Nice outfits, ladies — way to look good and go green! 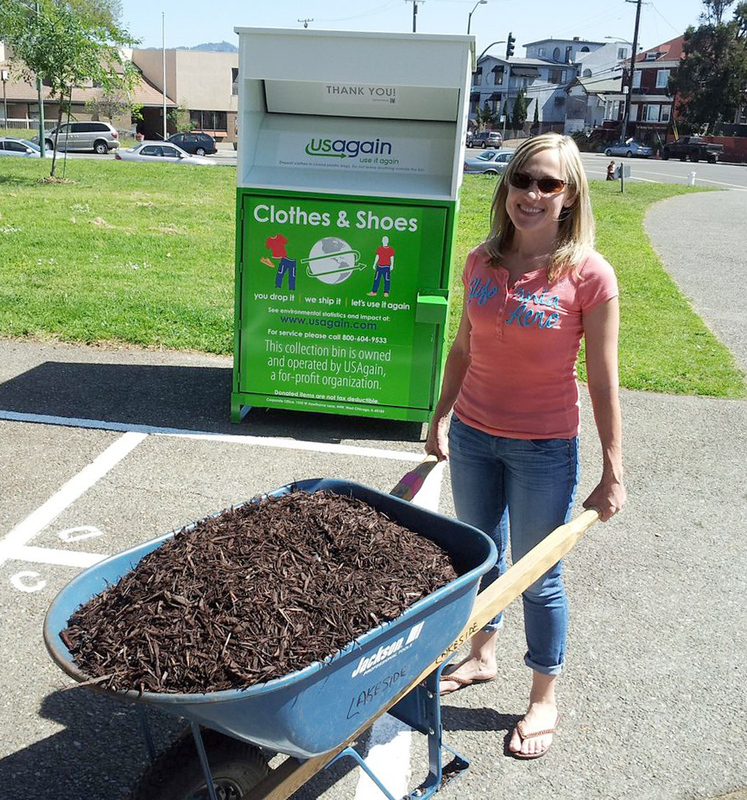 Members of our USAgain San Francisco team lent a green hand to the City of Oakland on Earth Day. 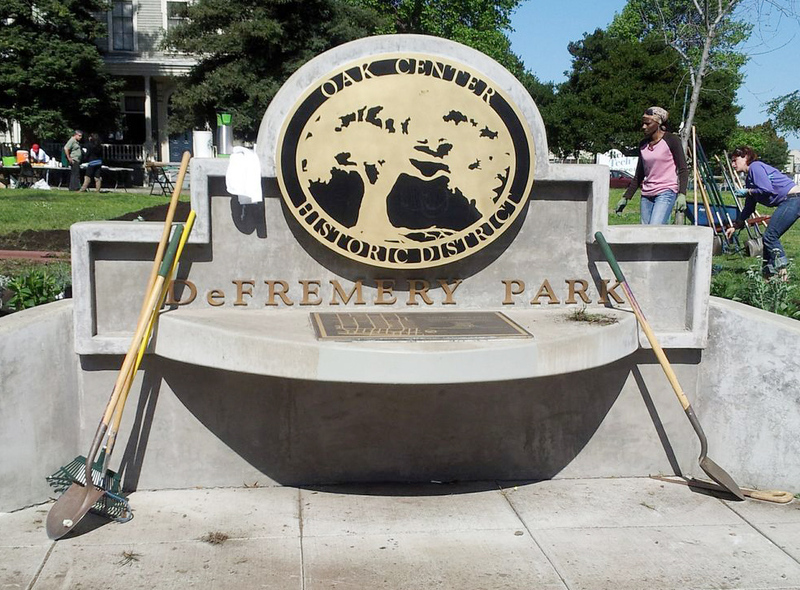 Together, we helped clean DeFremery Park, a popular center of recreation in the city. DeFremery Park is the oldest park in the city and home to a pool, tennis courts, a skate park, a recreation center, basketball courts, a baseball field and picnic areas. 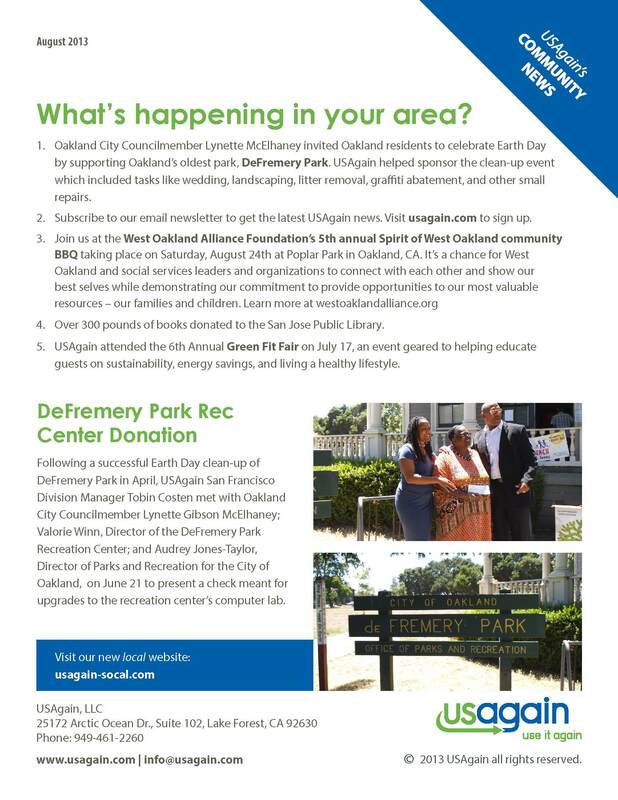 The cleanup event was organized by Oakland City Councilmember Lynette McElhaney, and all residents were invited to help clean the park. 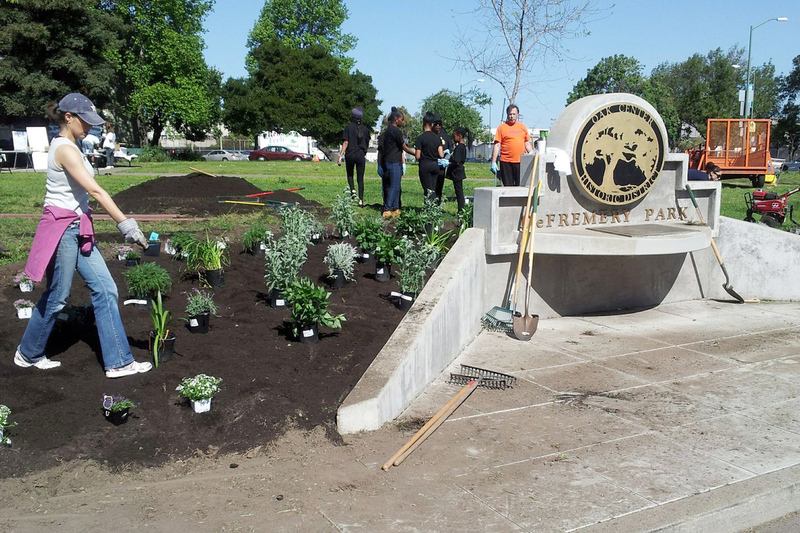 Cleanup tasks at DeFremery Park included weeding, landscaping, litter removal, graffiti abatement and small repairs to benches and other facilities. 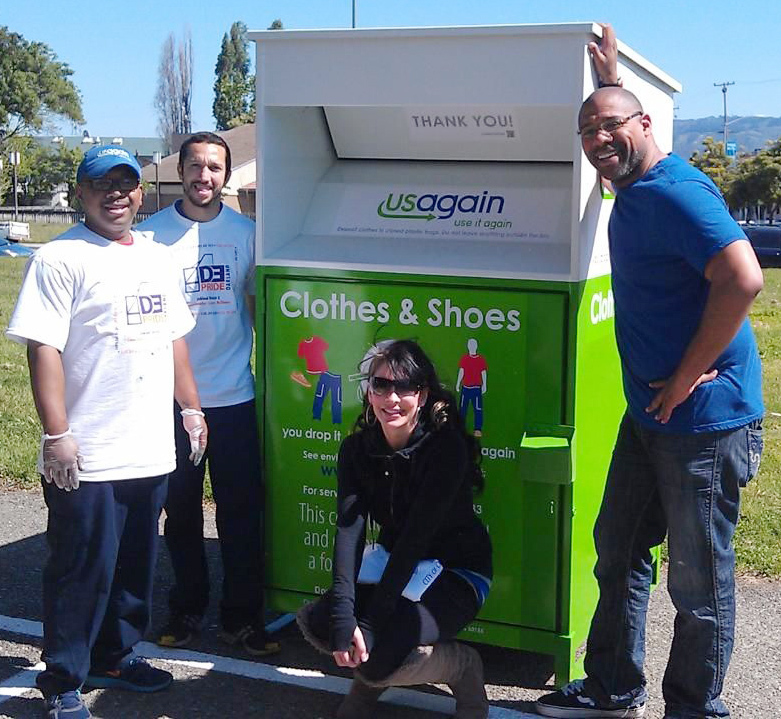 A USAgain collection bin was also placed at the park to provide Oakland residents with an easy way to dispose of their extra clothing and shoes. Check out some of our favorite shots from the event. Thanks for letting us keep you green, Oakland! 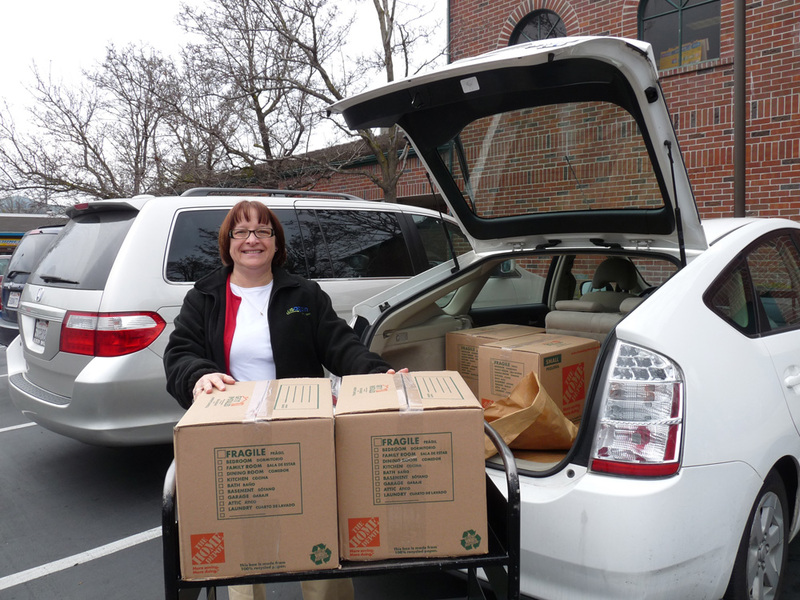 In partnership with Friends of the San Ramon Libraries, USAgain’s San Fransisco division donated four boxes of books totaling 141 pounds. Jenifer Leon, Coordinator of the Used Book Room at the San Ramon Library, received the books on January 24, 2013. Since the partnership began, USAgain has donated a total of 4,763 pounds of books to Friends of the Library groups in the Bay Area, including Alameda County, Dublin, Livermore, San Jose and Sunnyvale. USAgain’s donation was a part Friends of the Library in San Ramon’s Winter Book Sale, a seasonal event where gently used books, videos, CDs and DVDs are sold. For more information, visit the library’s site.